Scrunchies, and boy bands, and mix-tapes, oh my! Lots of big things happened in 1991 – including the founding of Exhibitpro. It’s hard to believe that it has been 25 years since Ed and I began this incredible journey, purchasing the Repro Group on September 21, 1991. At the time, Ed was virtually a “seasoned vet” in the trade show industry. After all, he’d been on a few show floors while traveling the country as a television producer and director. As for me, I’ll let you in on a little secret. When we began this journey 25 years ago, I had never even seen a trade show floor. My what we have learned. Since then, many things have changed. We’ve expanded our services to trade shows, events, and corporate environments; we’ve added too many new family members to count (clients, partners, associates, friends, and even a few pretty-incredible kids); we’ve produced more than 15,000 experiences; logged countless miles traveling to walk virtually every trade show floor in America; we’ve been first-to-market with new technology (would you believe Exhibitpro had the first digital, color printer in Columbus? ); and we’ve even moved a few times before landing in our current state-of-the-art design and production facility in New Albany, Ohio. The last 25 years have begun an incredible story. To say we are blessed, by all the people we have met and the things we have accomplished together, is an understatement. But it’s only just the beginning. We can’t wait to see what the future holds – and the story our friends and families will help us write from here. 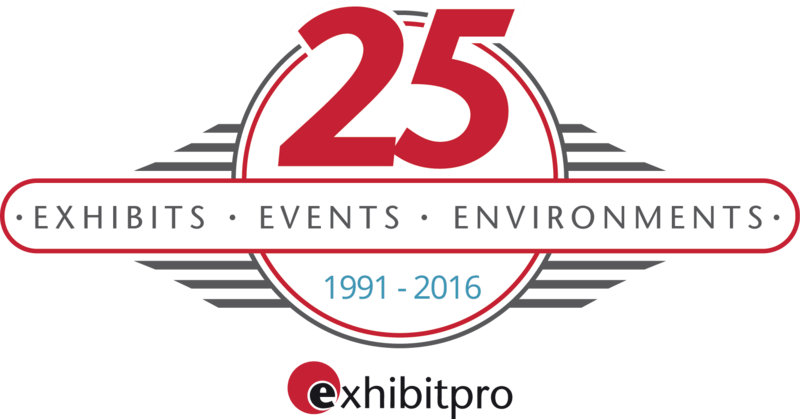 Please join us on September 21, 2016 – exactly 25 years to the day – to celebrate the beginning of the Exhibitpro story, hear about some of our best (and funniest times), and help us narrate our next chapter. Scrunchies and mix-tapes not required. When: Wednesday, September 21st from 3:00-8:00 p.m.